First Choice Background Screening (First Choice) is a Consumer Reporting Agency (CRA) that prepares Consumer Reports for authorized parties under the provisions of the Federal Fair Credit Reporting Act (FCRA) and other applicable states, federal and international laws. First Choice only collects data pursuant to written Authorization and Disclosure under the FCRA and only disseminates consumer reports to appropriate parties as directed in the written authorization. All individual consumer data is the property of the consumer about which it is procured and is maintained in a secured website. (Consumer is defined as the individual whom a background check is being procured). 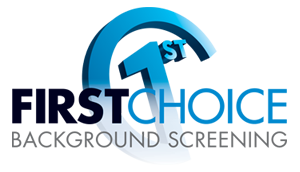 First Choice maintains strict policies and procedures in all aspects of its operation in order to protect the privacy of consumers, clients, and information furnished to us by utilizing the most secure methods of data collection, storage, transmission, and destruction. The United States Federal Trade Commission (FTC) and Consumer Financial Protection Bureau (CFPB) are the enforcement authorities with jurisdiction over First Choice. First Choice commits to cooperate with EU data protection authorities (DPAs) and comply with the advice given by such authorities with regard to human resources data transferred from the EU in the context of the employment relationship. 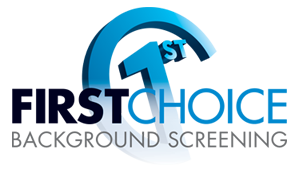 First Choice takes pride in setting itself apart by our strict adherence to, compliance with, and continuous education in state, federal and international laws and regulations that govern our industry, including but not limited to, the FCRA, FACTA, ADA, Patriot Act, Gramm-Leach-Bliley Act, and EU-U.S. and Swiss-U.S. Privacy Shield, when applicable. International data received from the EU or Switzerland is accurate, comprehensive, prominently displayed, accessible, and conforms to the Privacy Shield Frameworks. First Choice commits to cooperate with the Swiss Federal Data Protection and Information Commissioner (FDPIC) and comply with the advice given by such authorities with regard to human resources data transferred from Switzerland in the context of the employment relationship. Consumer Information: Consumer information is only collected at the direct, written Authorization of the consumer. Information is collected only to facilitate background checks for employment screening (for hire, retention, promotion or reassignment), tenant screening or employee investigations for reason of suspected workplace misconduct or wrongdoing. Certain information may also be collected to facilitate an employment-related drug test. Information collected may also contain credit history, criminal history, social security verification, motor vehicle records (“driving records”), verification of your education or employment history, or other background checks. Information is only disseminated to those End-Users (End-Users is defined as the Employer that procured the background check) that have been specifically authorized in writing by the consumer, or an agent (Agent is defined as a 3rd party approved by the End User) of the End-User operating on their behalf. Agent authorization must be made to First Choice in writing, along with a government-issued, photo ID in order to confirm the identity of whom the consumer report is being requested. (FCRA), 15 U.S.C. § 1681p § 618. All collection of consumer data is opt-in, by virtue of the written Authorization signed by the consumer. To opt-out of data collection, consumers can refuse to sign the written authorization for a background check. In addition, consumers may withdraw consent at any time by contacting First Choice. Previously collected information will not be deleted due to various laws that require us to maintain that information for a period of time; however, information will no longer be utilized or disseminated by First Choice for any purpose. Under penalty of law and in accordance with the FCRA, First Choice does not share, disclose or sell any information to unauthorized parties. Requests for Consumer Reports are initiated by First Choice clients that have agreed to request Consumer Reports only in those cases where there is a permissible purpose to do so, where the client has made disclosure to the consumer that they intend to procure a Consumer Report, and where they have received the consumer’s authorization to do so, as allowed by law. Consumer information is collected from First Choice clients and from consumers directly. Consumer Reports are prepared using information provided from many sources, including but not limited to First Choice clients, consumers, law enforcement agencies, local, state and federal agencies and record repositories, schools and universities (public or private), employers, public record researchers, credit bureaus and other Consumer Reporting Agencies. The Consumer Reports that are created for First Choice clients are shared only with the client that requested the Consumer Report and their agent(s), and with the consumer upon the request of the consumer. First Choice acknowledges the right of consumers to access their personal data. Individuals who wish to view their data, or make changes, may do so by contacting First Choice’s Compliance Department. If you are a U.S. resident and you do not wish to have your personal data made available to our client (for example, your current or prospective employer), do not authorize our client to procure a Consumer Report. By consenting to the procurement of a Consumer Report and submitting information to our client, you are agreeing to allow First Choice to disclose information about you to our client and to our sharing that information with our subcontractors. If you are a European Union resident or reside in other countries where First Choice is doing business, you may choose not to submit personal information to First Choice through the site or through forms provided by our client for that purpose. You have been provided a consent form either by us or our client. By filling out and submitting the consent form you expressly agree to provide personally identifying information and you consent to our use of that information in accordance with this policy. In connection with preparing Consumer Reports for our clients, we may in some instances employ other companies and individuals as our subcontractors to perform functions on our behalf; this is to obtain data from courthouses, school, employers, agencies and other sources of data/information. Subcontractors are contractually obligated to use and maintain the confidentiality of personal information in a manner consistent with this policy. These companies and individuals may not share any such information with any third party, other than their subcontractors, First Choice’s subcontractors or First Choice. Except as described in this policy or required by law, we will not use or otherwise disclose any of the personally identifying information that you provide or that we collect from third parties or other sources. Under the Privacy Shield, First Choice may be liable for the appropriate transfer of EU or Swiss individual’s personal information to third parties. Please be aware that First Choice may be required to disclose an individual’s personal information in response to a lawful request by public authorities, including to meet national security or law enforcement requirements. First Choice has further committed to refer unresolved privacy complaints under the EU-US and Swiss-US Privacy Shield Principles to an independent dispute resolution mechanism, the BBB EU Privacy Shield, operated by the Council of Better Business Bureaus. If you do not receive timely acknowledgment of your complaint, or if your complaint is not satisfactorily addressed by First Choice, please visit http://www.bbb.org/EU-privacy-shield/for-eu-consumers/ for more information and to file a complaint. Finally, as a last resort and under limited circumstances, EU and Swiss individuals whose privacy complaint has not been resolved by other avenues may seek redress with the Privacy Shield Panel, a binding arbitration mechanism. Consumers may exercise their right to inspect any data about them and to object to any data pursuant to the FCRA and applicable state law. See a “Summary of Your Rights under the Fair Credit Reporting Act” prepared by the Federal Trade Commission. First Choice provides companies of all sizes with quality pre-employment background screening services and the information needed to make more sensible hiring decisions. With over 25 years of experience and a unique specialization in the research of on-site public records provides, let First Choice support you with the assurance that the applicants you hire are who they claim to be.